If you’re an avid gamer, you may already be aware of this new trend. You might have seen videos of unsuspected players being tackled by armed police, handcuffed and dragged off to jail. The harrowing truth is that the victims of swatting attacks are not involved in criminal activity. The only reason they have been targeted is because they were streaming their gameplay live. In 2017, an unsuspected victim actually lost his life, after he was shot by police following a prank call. The deceased was not even a gamer; it transpired that another steamer had falsely given his address to avoid being swatted himself. Swatting started on the gaming platform, Twitch, but is already spreading to another medium. The only requirement is a live stream, so anyone using this feature on YouTube, Facebook Live or any similar website could fall victim. To keep safe, it’s important to stay aware of the threat, and know how to avoid it. Swatting can be defined as the act of fraudulently calling the emergency services to an incident at the address of the chosen victim. The prank is to dispatch the SWAT team, by citing a serious crime such as murder, bomb threats, hostage situations or an active shooter. 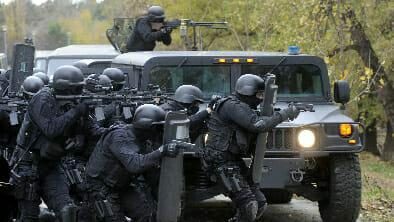 SWAT units – standing for Special Weapons And Tactics – exist in most countries. They are heavily armed, carry tools to breach doors and are authorized to use excessive force. Not only is swatting extremely dangerous for the victim but it also potentially takes the specialized teams away from real incidents where actual harm has been caused. Considering this, online platforms and law enforcement agencies are taking these pranks incredibly seriously. The caller of the incident mentioned above – which led to the death of an innocent citizen – was arrested on a charge of involuntary manslaughter, reporting a fake incident and interference with law enforcement. He has been in jail pending trial since December 2017, after which he could face up to 11 years in prison. Geo-location Data. Many camera manufacturers encode location data into their videos. While many platforms remove EXIF code to protect the creator’s privacy, Twitch.tv has explicitly stated they do not. On some websites, it’s also possible to extract this information via the data collected by HTML5 browser clients. IP Address. Your IP address is enough to give others an idea of your location. Swatters can easily get this information by sending an IP logger – disguised in a message or email. When you reply, it will flag your specific code and give away your address. It’s also possible for more sophisticated hacks to invade your network and extract this information. Social Techniques. It’s easy to be careless with your personal details online. If your name and address exist on any of your social media accounts, swatters can pluck the information easily. Similarly, if you order food while live-streaming – or any other activity that could give away your location – you establish yourself as a potential victim. Swatters don’t need much information to piece together your exact address. While there’s no universal way to prevent Swatting – other than never live-streaming – but you can take precautions to keep yourself safe online. The primary defense is to ensure your address isn’t accessible to any potential swatters. Use a Virtual Private Network. Using a secure VPN guards your location by diverting your traffic through an alternate server and falsifying your IP address. The software will also encrypt your data, so personal details can’t be plucked from messages, personal accounts or VoIP calls. Particularly if you stream from public networks – which are notoriously insecure – this added layer of protection will keep you safe when inputting information online, our list of the Best VPN. Guard Your Personal Information. Keep your personal details personal! Remove addresses and phone numbers from all social media accounts, never share this data via online messaging and avoid talking about it when connected. It’s easy to overlook security practices when sending your location to a friend on Facebook, but this is where dedicated Swatters can intercept your details, or guide on how to stay safe on Social Media. Use Two-Factor Authentication. Set up 2FA on your accounts will reduce the chance of intrusion. A simple username and password are no longer proficient to guarantee security, so many websites offer an added step. 2FA usually requires an additional code, which is sent to your mobile phone or an alternate email address. However, some companies will even provide a small hardware token to generate the extra passkey via a complex algorithm, more info on Two-Factor Authentication. Stringent Link Clicking. IP loggers usually take the form of suspicious links. By getting you to click, they can download malware that harvests your information. If you stream, never open links sent in the live chat and avoid messages or emails from people you don’t know. If a friend sends something that looks suspicious, confirm its authenticity via a call or text, before you take action. Register With Police. If you live-stream for a living, it’s worth registering with local law enforcement as a potential Swatting victim. Then, if they do get a call, they are less likely to activate procedure and may choose to trace the caller instead. Pre-empting the attack can also help speed up the arrest protest if you do get swatted, meaning you’ll be released quickly and not targeted in any follow-up investigation. Being Swatted can be an extremely distressing event. Your natural instinct may be to protest and fight the charges, perhaps trying to explain the nature of the prank. However, it’s crucial to act mindfully, as SWAT officers are authorized to use excessive force and even shoot to kill. Be aware that they believe a threatening situation is occurring and may read your actions as threatening or resisting arrest. Your best option is to succumb to the process. Keep your hands raised at all times, as reaching towards your pockets can be perceived as moving for a weapon. Stay quiet until you are given permission to speak or asked a direct question. You’ll be taken down to the station for investigation, which may be frustrating, but is inherently better than losing your life! If you notice your house has been surrounded before the team enters, don’t open the door. Sit in a visible position with your hands raised until the operation is over, or you receive further instruction. They will have to search your entire house before investigating each person individually – so be patient! Though it may seem like a harmless prank to some, Swatting is a criminal act that has dangerous repercussions for the victim. If you live-stream or regularly use sites like Twitch, you are at potential risk. Never participate or communicate with users who engage in such activities, and ensure you’ve taken all the necessary steps to stay safe. Using a VPN for privacy, hiding your personal information and using common sense online is your best weapon against becoming another Swatting statistic. Next > What is a VPN Log Policy?